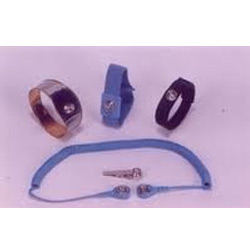 We are counted among the trusted names engaged in offering a wide assortment of Antistatic Wrist Band. Manufactured using optimum quality raw material at our vendors end, these products are demanded extensively by the clients and are appreciated for their durability and smooth finish. We make these wrist bands available to the customers in varied specifications, in order to meet their exact requirements effectively. Material : elastic nylon and textile metal fibre, elastic bracelet is adjustable. Looking for Antistatic Wrist Band ?